Magnesium Wheel Market size is estimated to surpass USD 28 billion by 2024; according to a new research report by Global Market Insights, Inc.
Increasing demand for magnesium wheels owing to benefits offered by these wheels including lower weight, improved performance, better damping factor coupled with superior heat dissipation are driving the magnesium wheel market share over the forecast timeframe. Rising preference towards producing lightweight vehicles and supporting government regulations to improve fuel efficiency and lower carbon emissions are encouraging the market expansion. Rising consumer inclination for sports & premium cars, along with bikes across the globe will support the magnesium wheel market growth. Forged wheels yield faster acceleration, reduces braking distance, and increases the overall vehicle performance. Additionally, the forged wheels include complex grain structure, that improves the wheel strength significantly. These wheels also contribute towards improving the overall vehicle power to weight ratio, thereby boosting the market share. 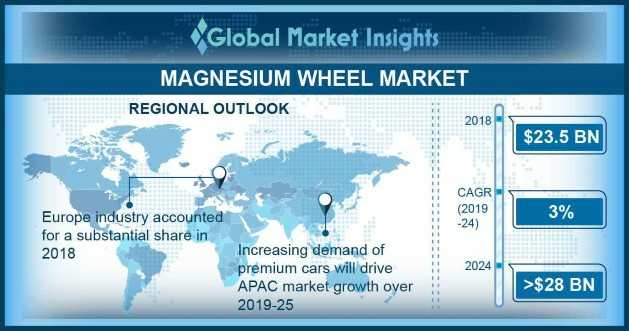 Shifting trends towards lower weight vehicles along with rising safety concerns are escalating the magnesium wheel market size. The inclination towards premium and comfortable driving experience owing to rising disposable income encourages industry players to replace traditional steel wheels with efficient and durable magnesium wheels. Additionally, the premium design and finish of such wheels improve vehicle aesthetics significantly, thereby proliferating the business share. Increasing R&D investments along with technological innovations are some of the driving factors positively influencing the magnesium wheel market size. These wheels find increasing adoption in sports cars and premium bikes owing to weight reduction and improved acceleration. For instance, according to the International Magnesium Association, magnesium wheels are around 33% lighter than the traditional aluminum and 75% lighter than steel. Additionally, the superior damping capabilities along with reduced vibrations makes these wheels ideal for travel across diversified road conditions. Several federal organizations are supporting R&D in magnesium technology development including the Canadian Lightweight Materials Research Initiative. This initiative is supported by the Climate Change Innovation and the Program on Energy Research and Development funds. These funds are allocated for conducting research on magnesium products and development of components for usage in automotive applications. Additionally, researchers in Canada are also collaborating with the U.S. Department of Energy and playing a crucial role in projects including Structural Cast Magnesium Development Project. Stringent government regulations promoting lightweight automotive components will escalate the magnesium wheel market growth. According to regulation of California Vehicle code, vehicle gross weight should not be more than 10,500 pounds. Automobile manufacturers are further focusing on introducing light weight, reliable and durable wheels, that are expected to replace the traditional spare wheels, thereby contributing towards vehicle weight savings. Forged segment dominates the magnesium wheel market size owing to its higher durability, ductility and easier repairing properties. Forged wheels are stronger than aluminum wheels and lighter than magnesium wheels processed with casting. For instance, forged magnesium wheel weighs 7.4 Kg compared to cast wheel weighing 10.2 Kg. Absence of casting defects and cracks will positively influence the segment growth. Cast segment will register considerable market growth owing to the lower production cost and simpler manufacturing process compared to forging. The ability to manufacture wheels of varying size and shape with significantly lower costs involved will further support magnesium wheel market share. OEM will grow significantly in the magnesium wheel market size owing to the rising inclination of manufacturers towards vehicle weight reduction. Moreover, the magnesium wheels offer higher stiffness and better heat dissipation, that makes them ideal to be used for sports and premium cars. Additionally, these wheels offer significant performance improvements and improves vehicle efficiency considerably. Lower weight wheels provide superior impact resistance and weight reduction, thereby supporting the magnesium wheels market growth over the projected timeframe. Moreover, increasing popularity of numerous sports events including formula one, Monaco grand prix and moto GP will further drive the product demand. Bikes will account for a considerable volume share owing to lower weight and easier handling offered by the magnesium wheels. The wheels improve the braking efficiency and provides superior rigidity. Moreover, the wheels have higher ability to bear impact, noise reduction and shock absorption. Additionally, these wheels allow efficient and smooth bike performance and reduced overall vibrations, thereby supporting the magnesium wheel market share over the study timeframe. Asia Pacific will experience significant growth in the magnesium wheel market size owing to the proliferating premium cars demand. The presence of numerous premium car manufacturers in China and Japan are further boosting the market size. Multiple automobile manufacturers including Porsche, Volkswagen and BMW among others are involved in new car launches with magnesium wheels. For instance, in 2018, Porsche launched its GT2 RS sports car in India with magnesium wheels. The prominent magnesium wheel market players include Tan-ei-sya, SMW Engineering, Cromodora Wheels, Enkei Corporation, and Minilite. The manufacturers undergo multiple stringent tests on wheels to ascertain the applicability of minimum standards for ensuring reliable performance under diversified conditions. Industry players are engaged in joint ventures and partnerships and are also continuously investing in expanding their distribution network for improving their market share. For instance, in 2014, Tan-ei-sya announced a strategic partnership with Counterspace Garage for distributing its forged wheels in North America.